and cornucopiae in left hand. Minted at offcina delta in Nicomedia (Izmit, Turkey) between December 308 and May 310 A.D.
Sutherland, C.H.V., "Roman Imperial Coinage", Volume 6 (RIC), Nicomedia, p562, nr 54a. hinterlassenen Sammlung und Aufzeichnung des Herrn Paul Gerin" (Voetter-Gerin), Nicomedia, Galerius Maximianus, p188, nr 6. 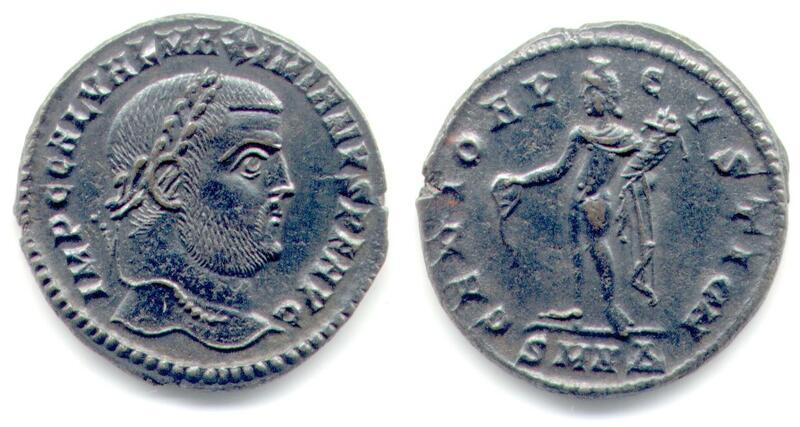 Van Meter, D., "Handbook of Roman Imperial Coins", p281, nr 27a, variety with Ol/11 and CMH in reverse legend.